When it was discovered that Aunt Heather’s cousin Tina’s computer was too outdated to do what she wanted with it and broken to boot, we decided to give it a new home. Now it belongs to Teaball, and is newly equipped with a Hello Kitty screen-saver, a My Little Pony desktop, a great kiddy drawing program, and bookmarks to all of T’s favorite places online. 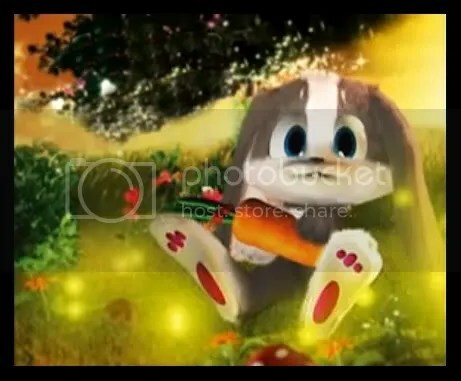 This was a daddy project, and it was so cute watching him scour the internet in search of desktop backgrounds and screen-savers that would be adored by his little girl (“… found some Blue’s Clue’s wallpaper, but I can’t find anything of the Care Bears!!!”). He also was the one to sit patiently by and teach her all she needed to know about her mouse and touchpad – and get her to the sites and programs that she wanted to visit (over and over and over again). I never thought that my kid would have a laptop at the age of two, but there it is, and it works well for us! I do have to admit to a moment of panic when I looked up to realize that all three of us were quietly playing on our respective laptops while sitting no more then 3 feet from each other – talk about spending quality family time. 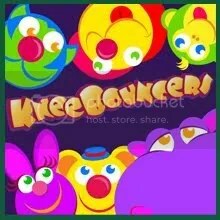 . .
Kneebouncers.com is a great site to find super-simple toddler games. I think that T is starting to get a bit too old for some of these, but she still loves playing her favorites. We discovered this site over a year ago, and T’s been hooked ever since. . .
Chapi Chapo is an old French stop-motion animation series from the mid-70’s. We big kids remember it from the 80’s, when it ran as a segment on the Nickelodeon show, Pinwheel. Each episode is about 5 minutes long, and T will tell you – she’s a “huge fan!” The cool thing is that since the episodes are so short, she can watch 6 of them in the half-hour that one cartoon normally runs. She’s happy cuz’ she feels like she’s watching more shows then we usually allow her, I’m happy because she isn’t! Her dad has taught her how to select the next episode from the menu – oh how empowered our little girl has become! 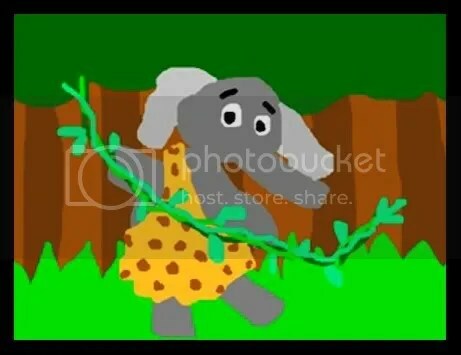 The Elephant song, a super silly tune by Eric Herman, is one that we adapt constantly for just about anything we can think of. She can’t get to YouTube herself, but she does know how to replay a song once we’ve taken her there. That is quite enough navigation for her for now, I think! 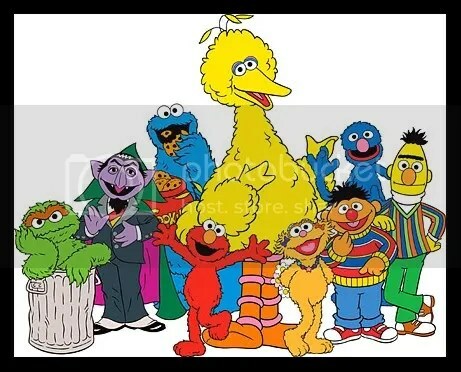 SesameStreet.org is another awesome place to go for all kinds of kiddy fun! Oh! And we mustn’t forget Chiyo-chans cooking song. . . Teaball LOVES this one, and will even sing along with it, though she couldn’t possibly know the meaning of the words. 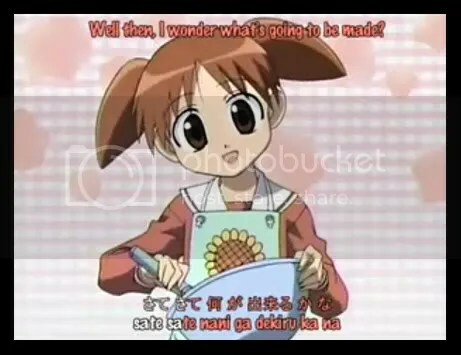 From the anime Azumanga Daioh, which T has never seen. Witch Doctor, that old nursery rhyme/song put to a symphony of silly characters and flashing bright insanity has been a favorite of T’s since it was put up on Albino Black Sheep by ZekeySpaceyLizard. . .
. . . as has The Birds and the Bees. And I have to admit – I love, love, LOVE this song by Patrick & Eugene. 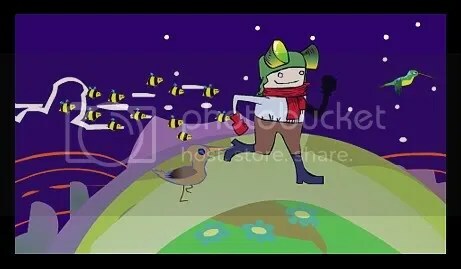 Again, the animation on this one was done by ZekeySpaceyLizard. T’s been watching this one practically since she was born. We used to use it to distract her from herself when she lost her mind for no reason as a baby. . . yeah, good parenting skills! There are more, loads more, but these are a few of the faves we’ve collected over the past almost 3 years. We’re always looking for more great sites for the little one, so feel free to send a link over if you’ve got a good one. I’m happy that she can visit them on her OWN computer now, because it kind of makes me nervous to turn my precious over to my toddler! awww so glad it’s working for little puff…she is brilliant already working a laptop at almost 3…I will b down saturday for a visit n some haircuts…love you guys…can’t wait to meet the little Ro baby! Ro-bee can’t WAIT to meet her Aunt Heather, and you KNOW T is pumped to see you – always! perhaps someday i’ll have some. you sould direct her to bigidea.com I know you’re not big on VeggieTales but they have some cute games on their site that should be just about just right for her. I thought that my daughter was ready for playing on the computer. (she’s 2 1/2) But she has trouble with it. I’m sure she will pick it up soon and be well on her way on her own… they do grow up SO fast! Its hard for them, the mouse that T is using is JUST the right size for her hand, its so tiny and cute. I don’t think she’d be able to do it very well with a big mouse. . . We also put a sticker on the right mouse button, so she would remember to only use that one! Your little lady will figure it out soon enough, I’m sure! So when can I pwn her on Sesame Street? I can count with the best, er, better of them. 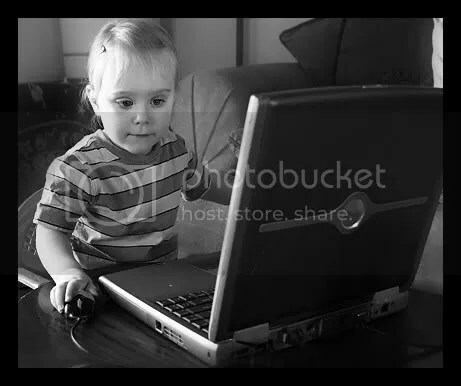 I bet she can navigate her way around the computer better than me!! Hope you and baby Ro are doing well. Can’t wait to see more pictures. That is awesome! It is so wonderful that T and daddy have something to care about so much together. 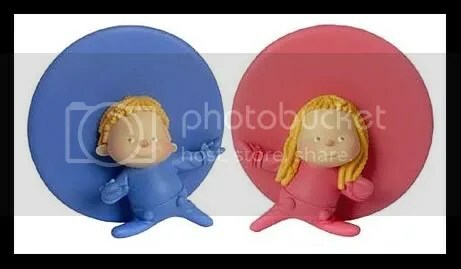 I’d be worried that the “puter” (as Tori puts it) would be all she wants, and then that would be one more battle after school. Dad gives in too much, so I really think it would be a battle. And I agree, not a huge fan of her having the ONLY computer in the house. Maybe I’ll let go some day. Wow she is soo smart! You’re brilliant! We tried out kneebouncers yesterday and it was sup dooper FTW! The little Miss could hardly be torn away from it. Cute!! I still can’t belive that she has her OWN laptop now. My kids certainly don’t, though giving them their own computer has been on the “to-do” list for a while. I dunno, though…it makes me super nervous! 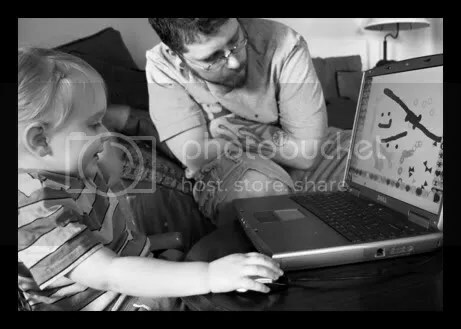 Super cute, though, and dad looks just as interested in the computer as T does. he! anyway randomness done for now. Have a fantasticak weekend!